The Olympic Park Legacy Company set out their vision for East London. A regenerated East End boasting an Olympic Park fit for champions was described by the Olympic Park Legacy Company as they set out their ambitions for the years following the 2012 Olympic Games. Plans include the development of five neighbourhoods based around the park, creating a total of 11,000 new homes, as well as a network of facilities, blending commercial opportunities, sporting venues and visitor attractions with the surrounding community. The park itself will be renamed the Queen Elizabeth Olympic Park and will be the hub of a comprehensive redevelopment of the area. 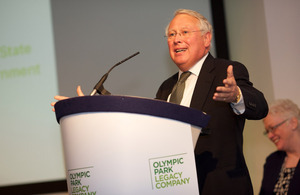 Communities Minister Bob Neill welcomed the Olympic Park Legacy Company’s vision for the Olympic Park alongside the Secretary of State for Culture, Olympics, Media and Sport, Jeremy Hunt and the Mayor of London, Boris Johnson. “This is an exciting time for the people of East London. They’re already set to host the greatest games event in the world and the Olympic Park Legacy Company’s new 20 year vision for the area means the future beyond 2012 is full of promise.